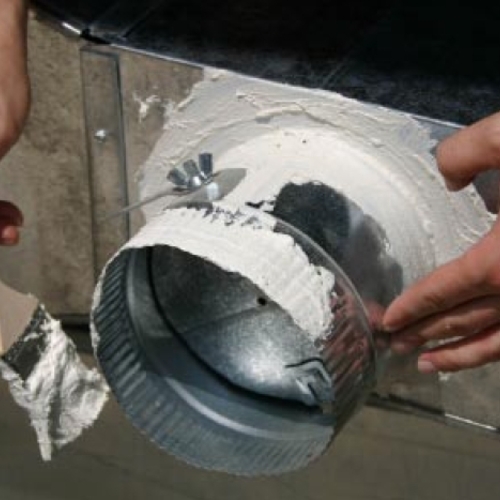 Rigid foam can be used in walls, roofs, and foundations, for retrofits or new construction. Most varieties of foam have a higher R-value per inch than fiberglass, cotton, or cellulose. There are three main types of rigid foam insulation: expanded polystyrene (EPS), extruded polystyrene (XPS), and polyisocyanurate. Key differences are R-value per inch, water resistance, compressive strength, permeability to water vapor, facings, and of course, cost. 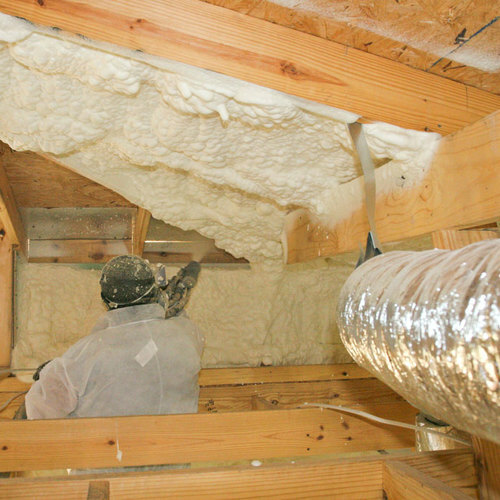 All foam insulation products are petroleum-derived. Rigid foam sheets are sold in several thicknesses; most lumberyards carry insulation ranging from 1/2 in. to 2 in. thick. Thicker sheets (up to 6 in. thick) are usually available by special order. If you are looking for a substitute for rigid foam insulation that isn’t made of plastic or petroleum, you might want to consider using cork insulation panels or semi-rigid mineral wool panels. Because a stud connects the inside of a house to the outside, it can act as a bridge for heat to escape (studs have lower R-values than insulation). Thermal bridging through the studs significantly degrades the thermal performance of the wall. 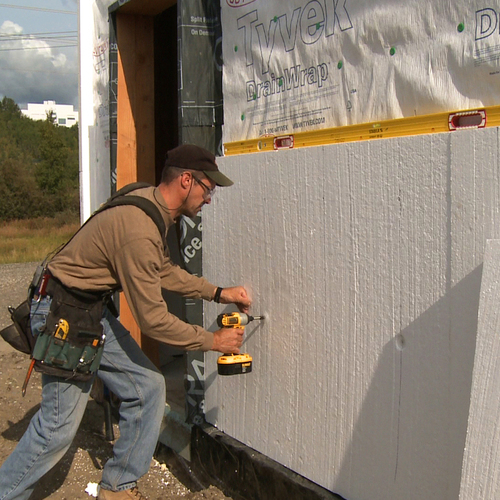 In all climates, exterior foam sheathing improves a wall’s performance. Installing rigid foam insulation over wall or roof framing reduces this thermal bridging, raises the R-value of the wall or roof assembly, and can eliminate or reduce air leaks. Building scientists Joseph Lstiburek and Peter Baker have reported that adding 1 in. of R-5 insulation to a 2×6 wall insulated with fiberglass batts increases the effective R-value of the wall from 14.4 to 19.4—a 35% gain with only a 15% increase in wall thickness. Adding 2 in. of foam raises the R-value from 14.4 to 23.8, an improvement of 65%. I just cruised thru the article relating to rigid insulation. Were you aware of the shrinkage problems with Polyisocyanurate insulation. Some reports show over an 1" in length and width. As far as I can tell, the problem was limited to polyisocyanurate manufactured for roofing applications. I have an old home in Colorado, built with no insulation in the walls. It didn't take much research to figure out that high density, closed cell, spray in place foam was the best way to insulate the walls. I stripped the walls and had them filled. As an engineer I was concerned with heat loss thru the studs. so plan to put up 1" rigid foam before drywall, this would make the total R value in the walls about R-27 to R-31. All the contractors, that have been in the house from window installers, ventillation, to drywallers have said I am going way over board. After reading a few things on this website over the past week I see that I was spot on about some of my concerns, and in fact I am now wondering if I am using enough insulation. Should I put more than 1" of rigid foam on the walls, if so how much? Once you have met code requirements, there is no simple answer to the question, "How much insulation do I need?" I've seen a variety of answers to this question, ranging from "as much as you can afford" to "twice as much as the code minimum." The more you install, the lower your energy bills will be. I submit that your article on Polyisocyanurate, under my point of view, is not sufficently clear and, thus, can drive to error in insulation project. Indeed, this product in a very good vapor barrior and,, thus, in my opinion, should ABSOLUTLY be intalled on the warm in winter side to avoid any mildew problem in walls. I think that this apply to medium (far north of Florida) to cold climate region. Cold-climate builders routinely install foil-faced polyiso as exterior sheathing without any "mildew" problems -- nor condensation problems, nor mold problems. Joe Lstiburek and Betsy Pettit have done several such houses in Massachusetts within the last few years. Roofers have been installing polyiso on top of roof sheathing on commercial buildings in very cold climates for many years. The polyiso warms up the wall cavities, preventing any condensation. As long as there is no interior polyethylene, these wall and ceiling assemblies work very well indeed. I am considering installing 2 inch Hunter H-Shield panels on top of the osb flooring in my attic. I'm looking to enhance the 6 inch Kraft-faced fiberglass which comes just to the top of the 2 X 6 joists. I know that this is unorthodox, but I cannot sacrifice the floor to pile on several inches of fiberglass or cellulose. I contacted the factory and they said it would be o.k. My single concern is that I may be adding a second vapor barrier. They say it will not. Any thoughts would be appreciated. Thanks for the good information. I'm trying to retrofit a 1970's residence in a cost effective manner. The existing 2x4 wood stud wall section is as follows, gyp board, interior palstic vapor barrier, R11 fiberglass batt, blackboard sheathing, masonite siding. I would like to remove the siding (which is failing) and add over the blackboard tyvek stucco wrap, then foil faced polyiso rigid, then a 1x nailer, and finally fiber cement siding. Do you think the tyvek stucco wrap will be enough to take care of the double vapor barrier problem? Any other thoughts would be appreciated. The colder the climate, the more important it is that any rigid foam insulation installed on the exterior side of OSB be thick enough to prevent condensation. The colder the climate, they higher the minimum R-value of the exterior foam. It is impossible to answer your question without knowing your climate. You do indeed have a potential "vapor barrier problem," since your interior poly prevents your wall assembly from drying to the interior — increasing the risk associated with adding exterior foam. Tyvek StuccoWrap is vapor permeable, and will not in any way reduce the danger of a double vapor barrier. The best approach would be to open up the wall and remove the poly, but that route is expensive and disruptive. And second possibility is to substitute EPS for your exterior polyiso, since EPS is much more vapor-open than polyiso. EPS will allow the wall assembly to dry to the exterior — slowly, to be sure, but much faster than if you had used polyiso. Thanks for your response. I’m in zone 5 where the conventional wisdom (not to mention code) for years has been to put a vapor barrier on the interior (warm) side. I was hoping to use polyiso due to its higher R value per inch. My thought was that the stucco wrap, or its cousin drain wrap, would act as an exit for moisture that might occur inside the wall assembly due to the double vapor barrier. Also, wouldn’t the polyiso raise the Dew point temperature sufficiently to reduce the possibility of condensation at the first condensing surface which is the back of the rigid? Adding R-value to these walls in an environmentally acceptable and economic manner is a tough nut to crack – so thanks again for your input. If you are in zone 5, and you plan to install rigid foam on the exterior side of your wall sheathing, the foam needs to have a minimum R-value of R-5 on a 2x4 wall to minimize the chance of condensation. You're right that a three-dimensional drainage membrane between the foam and the OSB allows for some "hygric redistribution" in the event that the OSB gets wet, lowering the chance of problems. I don't know whether the ridges in StuccoWrap are robust enough to perform this function. Also, there is a slight downside — some degradation of thermal performance — to decoupling the exterior insulation from the interior insulation with an intervening drainage gap. If the existing OSB looks dry, and there are no water stains or soft spots, the risks associated with adding polyiso to the exterior are low. If you switch to EPS, however, the wall assembly will be more forgiving. You can achieve any R-value you want with EPS; however, it will be thicker than polyiso of the same R-value. I have the 2009 IRC and have been trying to find the information on rigid insulation for some time. However, when I referenced what you had above, the entries were not even remotely the same. Do the IRC and IBC come out annually or, like other codes, on a multi-year basis? If it is multi-year, then where can I find the complete one and what is the difference? Sorry Sheleen, it was 314.4 in the 2006 IRC, but it's 316.4 in the 2009 IRC. I cahnged the sidebar to reflect the 2009 IRC. The code books are updated every three years. plan to use XPS for below grade basement wall against concrete slab in zone 5 climate to prevent interior water condensation on cold concrete. My question though, If I have a 2x4 wood framed wall with fiberglass insulation about 12 inches from the concrete wall do I really need rigid foam insulation in the first place as the condensation will not come in conctact with the water sensitive wall?? Yes, you need rigid insulation against the concrete to prevent condensation. If you have only fiberglass batts -- even fiberglass batts that are 12 inches away -- there's nothing to stop the interior humidity from reaching the cold concrete. Fiberglass batts are vapor permeable and air permeable. By the way, you don't need a 12-inch air gap between your insulated concrete wall and your studs. One or 2 inches is fine. Ideally, all of your required R-value will be provided by your rigid foam, and your 2x4 stud bays will be uninsulated. Depending on the amount of condensation, you could still have a problem. If the relative humidity of the air adjacent to the dripping concrete is always high, you could certainly have mold on your framing lumber and fiberglass -- even if the 2x4s aren't touching the concrete. Your point is well taken about the relative humidity of the air space, this will change my approach. Thanks for the thoughts, but one more issue I need to resolve before I use this product. What if once a year about 12 ounces(coke can amount) of rain comes over foundation wall between concrete and sill plate and down the concrete wall and onto the XPS. this water leak is a very rare occurence for me (despite grading as best as I can).. In fact the small amount of rain does not even puddle onto the ground it is so small in volume. I will try re-grading, but the XPS is mold resistant/water resistant so this should not be a high risk for mold growth even if I cannot fix this type of leak correct?? If liquid water enters your basement once a year, you need to deal with your water entry problem before you insulate. Period. The best way to handle it is probably to install an interior French drain -- a trench filled with crushed stone -- on the interior side of your wall footing. The drain pipe in the trench should lead to a sump; the sump should have a sump pump that discharges far from your building, or to a town sewer (if local codes permit). Then install a dimpled mat on your wall between the concrete wall and your rigid foam insulation. Getting started on a new home (zip code 72854) and my plan is to install at least a 1" polyiso ridgid board with the radiant barrier to the exterior fastened to the 2x6 studs (no osb) with a 1/2" air gap between it and brick veneer, then fill the interior walls with cellouse. Is the above plan okay for my zone?? If not what do you recommend?? Your question is like a scavenger hunt. You made me do some detective work on your Zip code, but I think I figured it out. You're in Arkansas. Your plan is a good one. Thank You Mr. Holladay,!! you've made my day!! Sorry about just the zip code, I shoulda at least added to my post "Arkansas". Yes, you can stack two layers of polyisocyanurate on top of each other. It doesn't really matter what kind of facing the polyiso has. However, if one side of the polyiso faces an airspace, that side should have foil facing. "However, if one side of the polyiso faces an airspace, that side should have foil facing"
What advantage does having the foil side face the airspace achieve? In my case the polyiso will be left an 1'' shallow in the slant cavity to create ventilation path up to the ridge. I assume then foil side would be pointed towards the exterior. Is their a max thickness from perm perspective that should not be exceeded when using polyiso in a slant wall application? When facing an air space, aluminum foil acts as a radiant barrier. It can raise the R-value of the air space from R-1 to R-2 or R-3. 1. My building official says that i don't need to ventilate this area, if I don't leave any air gaps. What is your recommendation--vent or not? 2. A house a couple of streets away recently went up with 2-layers of polyiso, and the roof sheathing nailed directly through the insulation to the 2/6 roof decking/ceiling. This affords the most simple configuration for laying the polyiso I suspect (minimal cutting), but does it make a weak nailing due to long nail exposure? And as my roof decking underneath the insulation is only 1X (rather than the 2X of the house nearby), I wonder if the nailing would be stronger if I used 2X4 sleepers above deck to provide a nailing surface? Does doing this affect the ventilation issue? 3. I saw a roof detail in a recent issue of FHB that included house wrap above the deck and before the insulation layer, what are your thoughts? 4. Winters are mild here, but it is moist all summer due to fog (think SF). My thinking was to provide 3-3.5" of polyiso between 2X4 sleepers, and provide venting (just to be safe) via a ridge and soffit vent system. Do I need a house wrap between the insulation and existing roof sheathing? What are your thoughts about sleepers and venting? If I were you, I would install two layers of polyiso with staggered seams, and then 2x4 sleepers, eaves to ridge, screwed through the foam to the underlying rafters. That creates your vent channels. Although the vent channels aren't strictly necessary, the 2x4s help secure the foam. 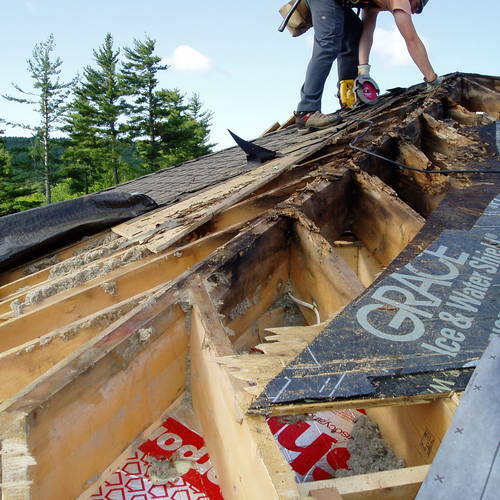 Then install your top layer of roof sheathing, your underlayment, and your roofing. I don't think you need any housewrap. Thanks for the information. Just to clarify; You appear to be suggesting that I add sleepers on top of the insulation, which raises two questions: 1) What r-value and thickness do you recommend I go for? One local insulating contractor told me, "More than 2" is a waste of money in our climate. I ask, in part, to learn about your thinking about the TWO LAYERS (versus 1). I had originally planned on 3-3.5". The other part of my question is with regards to the roof dimensional profile. 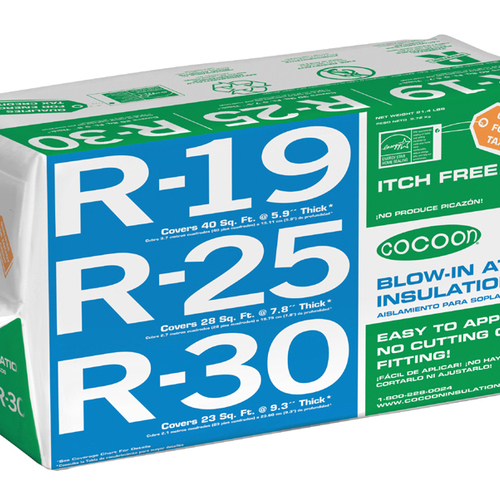 If I select for R-30, I am looking at almost 5" of insulation, right? ; plus the sleepers and the roof--so the fascia might be 10" or more tall. Might I use 1X4s as sleepers instead to reduce the roof profile and still provide enough vent space to prevent mold (via a 3/4" cavity)? Lastly, in terms of attaching the sleepers and insulation, you recommend that I screw-down the sleepers through the insulation. How do you recommend I do this--screw "top-down" through the full thickness of the sleeper, or "toe-nail" the screws? Since my roof will be attached to sleepers, which approach is strongest? 1. Concerning the R-value of the roof insulation: the first thing you should do is check local code requirements. I know that California's Title 24 differs from codes used elsewhere in the U.S. You need to find out (1) Whether the code applies to your retrofit work, and (2) even if the code does not apply, what the code calls for in your climate zone. Personally, I wouldn't want to install less than the minimum code requirement for ceiling insulation -- and I would probably want to install more. 2. Two layers of thin foam is better than one layer of thick foam, because the staggered seams reduce air leakage and heat loss at the seams between the foam panels. 3. Sure, you can use 1x3s or 1x4s instead of 2x4s. 4. Most installers find it easier to screw straight down through the foam, hoping to hit the rafters. Trying to install the screws at an angle would only make the task of hitting the rafters more difficult. I appreciate your advice (especially on a Saturday), and will take it. PS: I was initially thinking you were suggesting 2X4s "on edge" over the polyiso; later realized you likely intended my laying them flat--hence my question about "nailing". Martin, I have found a source of 3" polyiso board that does NOT have a foil/radiant barrier can it still be used for exterior brick veneered walls using a 1" air space, and I get very puzzled looks from suppliers when I ask about what is needed and how are the brick ties attached to the building without causing major leaking? Is there made such a brick tie available, if so where? Re-post your brick tie question on our Q&A page. The brick masons who can help answer your question will never find your question on this encyclopedia page. In concrete block residential construction, it is a common practice to place foils faced rigid insulation board directly against the interior face of the block, and then nail 1x furring strips over to support the drywall. This gives a 3/4" air gap for the reflective insulation, but does it not also create a vapor barrier on the inside of the building? Most rigid insulation and foil products have a very low vapor permeability. What would be an acceptable alternate? Q. "In concrete block residential construction, it is a common practice to place foil-faced rigid insulation board directly against the interior face of the block, and then nail 1x furring strips over to support the drywall. This gives a 3/4" air gap for the reflective insulation, but does it not also create a vapor barrier on the inside of the building?" Q. "What would be an acceptable alternate?" A. There are many ways to insulate a wall, but you haven't convinced me that there is any problem with using polyiso (or any other rigid foam insulation) on the interior of a concrete block wall. What's the problem? The concrete block wall can easily dry to the exterior. (A concrete block wall is also invulnerable to moisture -- it won't rot.) The interior strapping and gypsum wallboard are at interior conditions and stay dry. What's the problem? Where's the moisture you're worried about? If you prefer, a concrete block wall can be insulated with rigid foam insulation on the exterior. Either way works fine. I have 2x6 framed wall on top of a stepped ICF foundation which is 12 inches thick. The 2x6 wall is close to flush with the outside of the ICF. I propose to insulate the framed wall from the inside with rigid foam. Will this lead to a condensation problem? Q. 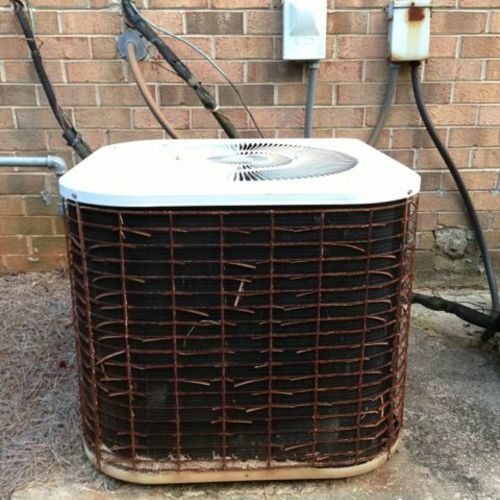 "Will this lead to a condensation problem?" A. No, as long as you install the foam insulation in an airtight manner. You want an interior air barrier, so that warm, interior air is unable to reach the cold wall sheathing. First - Thanks Martin and others for such consistently useful and well-informed advice! I've received numerous helpful responses that are ensuring my own project is properly detailed. This question is for my sister's place in Chapel Hill, North Carolina, which is a different climate than I am familiar with. It's climate zone 4. Hot and humid in the summer and cold in the winter. We're considering what the best insulation would be to use for the interior wall cavities. The house is built with 2x4 framing, approx. 24" on center, but very inconsistent stud spacing. There is a 1" layer of XPS on the exterior of the studs. There is planking sheathing in some places and not others, and some 1/4 plywood in some places and not others. No clear vapor barrier anywhere or housewrap, etc. I doubt the 1" XPS is applied perfectly or taped or sealed or anything attempting to create a tight air-seal. The house is gutted, but there is little budget for extensive retrofits for insulation. Spray foam options are probably overly expensive. We could use cellulose or FG batts on the interior. For higher R-value, though, we are considering fitting polyiso rigid boards in the exterior wall cavities and trigger foaming the edges. It's more labor intensive, but would get us much higher R-value for these thin walls. And given the spacing of the studs is so inconsistent, i.e. not uniform 24" OC, FG batts would probably have more gaps than usual. Would it be a moisture problem to combine the vapor barrier properties of rigid polyiso boards in the stud cavities with the 1" XPS on the exterior? At least the 1" XPS is reasonably permeable. I am also wondering whether to recommend furring out the interior walls with crosshatch walls or somethjng like that to create additional space for blown-in cellulose. Most experts advise against creating a "foam sandwich." It probably wouldn't be a good idea to sandwich your plank sheathing between two layers of rigid foam. Although some limited drying is possible through 1 in. of XPS, any drying would be extremely slow. I would install cellulose insulation in the wall cavities. If you install horizontal 2x4 strapping on the interior side of the walls, you can create a thicker cavity to hold more insulation. Remember -- don't install any interior polyethylene. Thanks for the response. I was worried about the "foam sandwich" issue as well, and agree with your recommendation about furring out thicker walls and insulating with dense-pack cellulose. One reason my sister has been nervous about cellulose is that local insulation contractors have been decidedly anti-cellulose in their discussions with her. They have made some claims which I tend to think are totally bogus, but which I don't have sufficient info to conclusively debunk. For example, one insulation guy suggested that the fire retardants manufactured into the cellulose insulation only last for 7 years. Everything I read suggests that cellulose, especially the dense-pack nature of its installation, increases fire resistance. I've never heard anything before about the fire retardants added to cellulose dissipating or losing their effectiveness over time. Sounds totally bogus to me, and my suspicion is that some insulation companies believe they can make more money faster by slapping in the FG batts than doing a professional job dense packing cellulose. Another thing they told my sister was that the cellulose would create mold issues, especially in the humid South. Again, my reading says this is a non-issue, but the professionals make this out to be scary. Am I right to tell her that there is nothing to those claims? If your sister wants accurate information on cellulose, she should talk to an insulation contractor who specializes in cellulose. If she is talking to contractors who usually install fiberglass batts or spray foam, she is unlikely to be getting accurate information about cellulose. Polyisocyanurate (i.e. Dow Super Tuff) is the only rigid foam product carried in stock by two local home center retailers (i.e. national chains). Is it an acceptable product to apply to the interior foundation wall? (i.e. poured-in-place concrete below grade). The foam board will be taped and covered with 2"x4" framing, fiberglass batts and drywall. Outside leakage to the basement? Once in a blue moon. Thank you ... appreciate any guidance. You wrote, "Outside leakage to the basement? Once in a blue moon." I'm not sure what kind of leakage you are talking about -- air leakage or water leakage. But if your basement wall is leaking water into the interior of the basement -- even if it only happens "once in a blue moon" -- you have to correct that problem before insulating your basement wall. Once you have solved the problem -- by re-grading your yard, installing roof gutters and downspouts, or by correcting a problem with your footing drains -- you can proceed to insulate your basement walls. If your basement wall is perfectly dry, and if it never leaks water (even once in a blue moon), you can certainly use polyisocyanurate to insulate the interior of the wall. Thank you for your prompt response ... very helpful.
" ... I'm not sure what kind of leakage you are talking about -- air leakage or water leakage...."
" ... Once you have solved the problem -- by re-grading your yard, ..."
" ... you can certainly use polyisocyanurate to insulate the interior of the wall ..."
The Dow product is comprised of three-ply poly/aluminum foil facers laminated to the polyiso foam core. I presume that additional piece of information will not change your answer. Correct? My response is unchanged. The foil-faced product is fine. We have a third floor condo in Chicago with Cinder block-Firring strip Wall construction. Since firring strips are used in place of 2x4 studs I believe there is 3/4"-1 1/2" wall cavity for insulation and fiberglass bats are probably not going to be of any use What is the best product for insulating the room. Also would I need a vapor barrier when using rigid foam board? You won't get much insulation in a 3/4-in. gap, so you'll need to thicken up your wall to get significant insulation there. If you are willing to lose interior space by thickening your wall, a wide variety of insulation materials could be used. Polyisocyanurate has one of the highest R-values per inch. If you choose to use rigid foam insulation, these products are all vapor retarders or vapor barriers, so no further vapor retarder is required. I am building a new home and have been trying to determine the cost effective amount of foam to use on the exterior. The home is near Wisconsin Dells, WI. I was planning to build a 2x6 wall (R-22 Cellulose) with continuous OSB & 1.5" XPS foam on the exterior. Would this be an acceptable system for our climate? Do I risk condesation on the interior surface of the OSB? I would go to 2"XPS, but with our system, the costs really jump from 1.5" to 2". Also, if it is a good idea, I will use a Smart Vapor Barrier on the interior to allow some drying that direction because the 1.5" of XPS will limit so much to the exterior. Thanks for the other input on this page so far! We have the common situation of how to make a crawl space warm by closing up the block vents and applying rigid insulation to the interior face of the CMU walls. 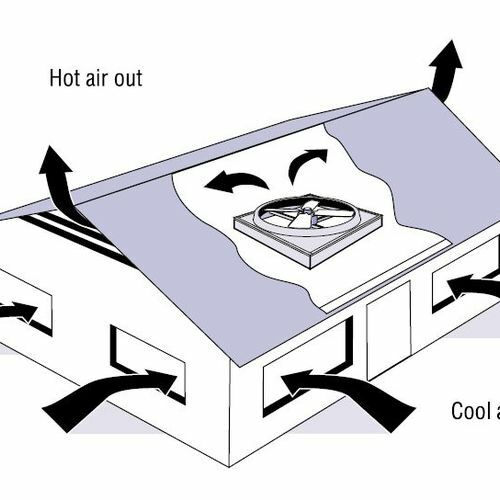 (We will comply with the ventilation requirement with a small amount of interior air per exception 4 of IRC 408.2.) I believe that Dow Thermax foam insulation can be installed to the interior crawl space walls without a supplemental covering (as would be mandated by your sidebar and IRC 314.1.2), because it is claimed to have a foil face that has been tested to meet ASTM E 84 for flame spread and smoke developed. It seems like an ideal way to achieve a warm crawl space without having to apply gypsum board over the foam. (The ICC legacy report number is NER-681.) Am I missing something? Q. "Am I missing something?" A. No, you are not missing anything. But as I'm sure you know, every local code inspector makes the final determination of whether any proposed detail is code-compliant. Most code officials agree with your analysis, but some do not. Be sure to run it by your local official to be sure everyone is satisfied with your proposal. I currently have a project that is asking for a rigid insulation that is equal to an R-19 value. I have done research and have not been able to come up with a rigid insulation that has a R-19 value. Do you have any suggestions. It would be greatly appreciated. But why do you have to achieve R-19 in a single thickness? It's usually better to install rigid foam in multiple layers, so you can stagger the seams. Our foundation will be poured in just a few days here in zone 6, (northern NH), and I'm getting a lot of different opinions on how we should insulate. I will have a radiant slab heated basement, and NH requires that I insulate the walls to R-15 from footing to sill. Our options are 3" of rigid on the outside, or any number of options on the inside, (our builders prefer Dow Thermax), or a combination of both. I don't like the idea of exposed insulation on the exterior, nor do I like having my structure over some concrete and some insulation, (I'd rather have it over all concrete). But the world is our oyster since it's new construction -- does anyone care to offer their preferred insulating system in this case? It's very important that you install a continuous horizontal layer of rigid foam under any slab with radiant heat. In your climate, I strongly suggest that you use at least 4 inches of rigid foam. You won't regret it. Either EPS (if you choose the right density) or XPS will work; EPS is more environmentally friendly. There is no single answer to the question of whether to install basement wall insulation on the interior or the exterior. Both approaches have advantages and drawbacks. If you insulate on the interior with rigid foam, it's easier to avoid a thermal bridge at the connection between the sub-slab foam and the wall foam. 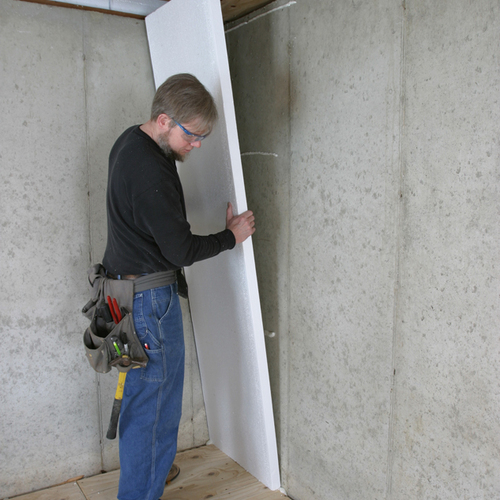 Whatever you do, don't ever use fiberglass batts to insulate a below-grade basement wall. Thank you for the advice, Martin. I'm definitely doing under the slab, and at this point am considering using at least 2" rigid on the exterior at the base of the foundation walls, (to insulate the edges of the slab), but leaving it below grade, and then adding at least 3" of rigid from top to bottom on the interior to achieve the R15 requirement. In that case, the foundation will be inside 2 layers of rigid below grade, with only interior rigid above grade -- do you think that's a viable option? EPS on inside of fiberglass batts? 1. Installing interior EPS is OK.
2. Your chosen thickness -- only 1/2 inch -- has negligible R-value (about R-1.8), so it's hardly worth installing. Two inches of polyiso (R-13) would be much better. 3. Why insulate between the studs and rafters with fiberglass batts -- the worst performing insulation available? If you can afford to install new dormers, you can afford better insulation. 4. Tyvek is not a vapor barrier; it is vapor permeable. We are building a new home in Zone 2 - South Texas. We are planning on using the ridgid foam insulation with concrete siding - our contractor is concerned about the strengh of the foam insulation walls - carrying the concrete siding. Should we also use OSB and if so when should it be applied? If you are building a new house, and if you don't know whether or not to include OSB on your walls, it's time to call in the professionals. Your team needs an architect or an engineer; it sounds like you don't have either. They can answer your questions about wall sheathing options. If your builder wants more information in attaching siding to vertical furring strips over foam, here's an article with more information: Fastening Furring Strips to a Foam-Sheathed Wall. Hello. Excellent forum. Thanks a lot! I'm remodeling and residing a house that has 2x4 framing with fiberglass batts but NO sheathing under the current siding, only a layer of builders felt between framing and siding. I'm arguing with my remodeling designer who wants me to remove the batts when I expose the framing and apply spray foam. I want to use foil backed rigid foam sheathing. My designer says that the rigid sheathing will act as a moisture barrier and cause condensation problems in the wall. I've read that the polyiso foams with foil back are indeed a moisture barrier, so how can one prevent condensation on the warm (interior) side of the barrier? Also, will the felt/siding exterior be a sufficient substrate for spray foam if my designer gets his way? Your question -- "how can one prevent condensation on the warm (interior) side of the barrier?" -- shows a fundamental misunderstanding. Condensation does not occur on warm surfaces; it occurs on cold surfaces. In general, if polyisocyanurate sheathing is properly specified -- that is, if it is thick enough -- its use will prevent condensation, because the interior side of the polyiso will always be warm (above the dew point). Here's an article discussing the issue: Calculating the Minimum Thickness of Rigid Foam Sheathing. Concerning your second question -- "will the felt/siding exterior be a sufficient substrate for spray foam if my designer gets his way?" -- it's impossible to answer without a site visit. It's really not a great idea to install spray foam from the interior if the house has no wall sheathing, but in a remodeling situation, it's sometimes necessary to choose the "least-bad" path. You need to be sure that foam won't ooze through cracks and appear on the exterior, through the siding, and you need to consider whether the spray foam will make future siding repairs difficult. My husband is preparing to drywall our garage. He wants to put polyiso rigid foam insulation between the wall studs. He is cutting the foam 15" wide by 8' high and pressing it into the stud wall cavity. He has two layers, one is 2" thick, with the foil side facing toward the inside of the house, and then he is putting a second layer of 1" thick polyiso board on top of this, with the foil facing the garage. Then, he was going to drywall over that. Is this ok? I'm just wondering if the warmer, moist air from inside the house will get into the walls and condense as it moves closer to the colder drywall. The garage will not be heated. 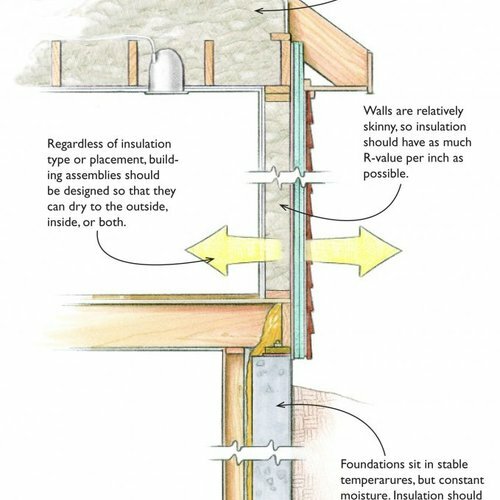 If this is not a good approach, could you advise the best way to insulate the garage walls? Thank you! The plan will work, as long as the edges of the sheets of polyiso are sealed carefully with caulk or canned foam to prevent air from getting around the edges. Great, thank you. We'll seal the edges with canned foam. I'm not familiar with the type of aluminum-faced panels you are describing, but it sounds like you have a serious thermal bridging problem. You can solve the problem with either interior or exterior insulation; your choice. If you only address the ceiling, rather than the ceiling and the walls, you may still have a thermal bridging problem at the perimeter of the ceiling. Any type of rigid foam -- EPS, XPS, or polyiso -- can be used. Polyiso is the most environmentally friendly of the three. Of course, the thicker the insulation, the better. Hey Martin...The room is a Sunroom that is heated and cooled. The panels are three inch thick super insulated sunroom panels. Manufactured with extra-dense one piece polystyrene and sandwiched in aluminum alloy skins and locked together with the added strength of structural I-beams. The "I- beams " are aluminum which conducts the heat and cold causing the thermal bridging problems. If I install rigid foam insulation on the exterior (roof and walls) and re-side and re-roof will that solve my problems?...BTW...tks for the quick response. Q. "If I install rigid foam insulation on the exterior (roof and walls) and re-side and re-roof will that solve my problems?" A. Yes, as long as you come up with good attachment details for the new foam and new sheathing (if any). paper facing, for the inside layer of two ext layers? A nearby lumberyard has a lot of thick RMax with paper facing, and fewer, thinner sheets with foil facing. Is there any reason I should avoid making my inner layer of two exterior foam board layers that paper-faced insulation? I'd like to take advantage of the thick stuff if I can. Q. "Is there any reason I should avoid making my inner layer of two exterior foam board layers that paper-faced insulation?"